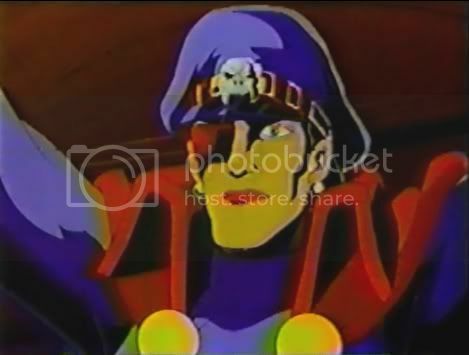 GI JOE EXTREME SEASON 2 CARTOON REVIEWS COMMENTS eps 14-16- BLOOD FOR THE BARON!!! 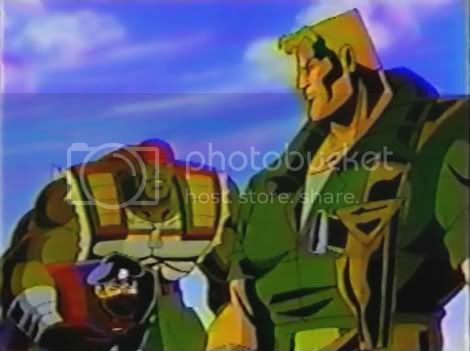 The episode starts off with the GI Joe team receiving medals for beating Iron Klaw (episode 13). The President goes on TV and tells everybody that Iron Klaw was defeat and S.K.A.R. doesnâ€™t have a leader. S.K.A.R. 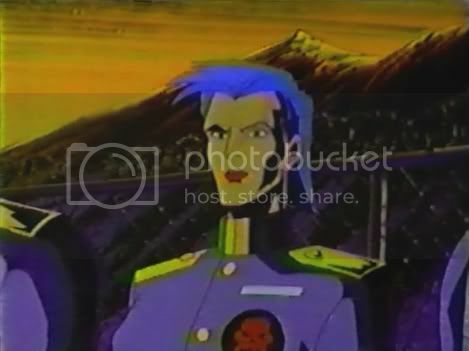 soldiers and Steel Raven are watching the telecast and are in shock about the news that there leader is dead. Rampage hears of the news, and wants to become S.K.A.R. 's new leader. Some of the Joes want to go out and party ( Metal Head and Black Dragon ) but Sgt. Savage stops them and points out that they didnâ€™t get dismissed yet. Lt. Stone okays it and Clancy agrees to it as well ( remember he is really IRON KLAW in disguise ) as he needs time to figure out what to do next . Lt. Stone and Sgt. Savage are talking about what happen, Lt. Stone doesnâ€™t think Iron Klaw is dead (He wants to see the body). Steel Raven thinks about S.K.A.R., and how she started with the group. We get to see a young Steel Raven here before she received her eye patch . Suddenly, Raven gets a call on her personal armband communicator, and itâ€™s Iron Klaw. He tells her to keep his army together and not to tell anybody that he is still alive. Then you see that Iron Klaw is dress upped as Clancy. Rampage is gathering up his robots but he only has three. He wants to know why he doesnâ€™t have any more robots, but his Michael tells him that he doesnâ€™t have any money to build more. Rampage gets Michael to tell the S.K.A.R. soldiers that he is going to rob Fort Knox. He starts the attack on the fort, but GI Joe comes in and cleans up the S.K.A.R. troopers. They talk about how the soldiers arenâ€™t fighting hard with out Iron Klaw. The Joes take Rampage as a prisoner, but they are attacked by S.K.A.R. Sky Stalkers. They try to take out the Jets, Quick Stryke catches a ride on one, and takes control of it. Two other Joes take out the other plane, and Steel Raven finally gets her first Dogfight with Mayday. Steel Raven has the advantage as she is in the Jet and Mayday in the helicopter with Metal head. The fight starts turning bad for Mayday so she enters a tunnel where Steel Raven canâ€™t follow. Steel Raven immediately flies ahead to the other side and awaits Mayday. Mayday and Metal head spot a tanker , stops it and evacuates the pilot. Out side Steel Raven gets impatient and fires missiles into the tunnel. The missiles hit the gas tanker and the resulting explosion fries Steel Ravens guns. Without anyway to attack ,Steel Raven flies off swearing she will get her chance again to defeat Mayday in a Arial combat one day. On the ground the JOES want to know how S.K.A.R. knew about where they were at, completely unsuspecting of Clancy. The Joes leave with their prisoner Rampage. Later at a S.K.A.R. BASE Iron Klaw is talking to Steel Raven via a telecast from Clancyâ€™s office She apologizes to him for her failure but he tells Raven not to worry about the failed attempt and that she did good job and ask her if she got the much more important thing he wanted. She replies â€œyesâ€ The much more important thing turns out to be the real Clancy ! Iron Klaw wants Steel Raven to get all of the pass codes and information Clancy knows about especially any information on the Joes . Steel Raven is delighted at this order and starts to pull out her interrogation tools. Much to Clancyâ€™s dismay. This was the first episode that I had seen from season 2 and I was very impressed. Not only has Extreme continued with great stories and character development, but the structure of season 2 is fantastic. Not only does this episode have it's own story that plays out, but it also carries on the larger story of the apparent death of Iron Klaw and the infiltration of GI Joe by the very much alive Iron Klaw with plenty of twists and turns. The only downside to this episode was the Rampage. He appears to have no authority over his own factories so must rob Fort Knox to pay himself to start up his factories again. The story /episode lays a lot of ground work, but with the Rampage side story fizzling out the action is a little lacking. On a positive note it is great to have Ravens Backstory introduced and I look forward to a future episode explaining more of her back story and the loss of her eye. 3. Freights uniform changes slightly too, gone is the blue shirt and is now replaced with the much more realistic white shirt. This is the freight I remember and like. The blue was okay looking but this is just so much more realistic. 5. 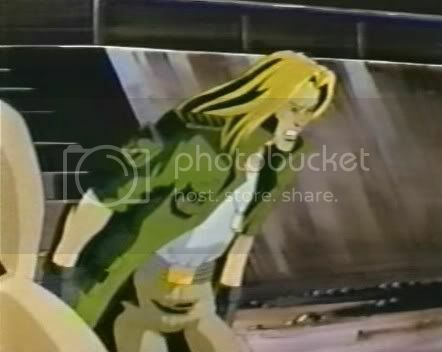 This episode also shows how important Steel Raven is to Iron Klaw as well as showing a younger Steel Raven before she lost her eye. 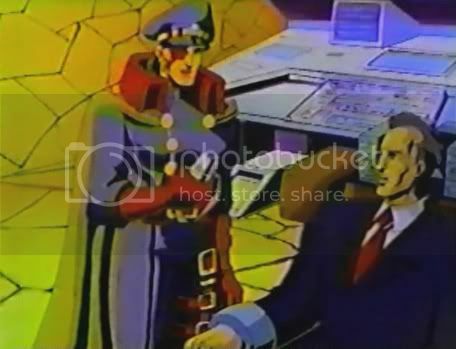 I know Jamar and Ecmagee1984 has already reviewed this episode, but of all the episodes of Extreme that Iâ€™ve now seen, my favorites were part of a multi-episode arc in Season 2 involving an assumed-dead Iron Klaw stealing Clancyâ€™s identity as government liaison to and essentially commander of, the Joe Team. This aspect of Extreme that came into being in Season 2 â€“ episodes that worked stand-alone but also played into a serial story-arc, was one of the most thrilling and sophisticated thing that Extreme had to offer. 1. Some gratingly over-the-top voice work, especially in Iron Klaw (too gravelly), Sgt. Savage (too shouty and Sgt. Slaughter-like), Freight (too gruff ), Heavy Metal (too Ninja Turtle), and, to some extent the John Wayne/Sgt. Savage I/Optimus Prime style drawling of Lt. Stone. Irritating voice work isnâ€™t the invention of Extremeâ€¦ in the Sunbow series the shouting of Serpentor and the growling of Sgt. Slaughter was enough to make me want to turn the show offâ€¦ but on Extreme, there sure are a lot of silly voices. 2. Ugly colors/coloring. There are a lot of oranges and purples, and of course, the weird black shadows everywhere, that are a bit of an assault on the eye. 3. Poor animation. Particularly when characters or vehicles are supposed to be receding from or advancing towards the camera at an angle, it often looks like they are moving diagonally. So, the show is, at times, hard to watch or hard to listen to â€“ I can rarely sit through more than one episode at a time, but it is usually dramatically compelling, and sometimes more sophisticated than prior incarnations of Joe. All right, now that the complaining is out of the way, here are my thoughts on the episode. Jamar has already described the plot, so I wonâ€™t recount it here, but there are some major elements presented here that are very intriguing. The savvy, sultry SKAR field commander by the name of Steel Raven is here introduced and given hints of a back-story. We learn that she joined SKAR because she was truly inspired by itâ€™s elitist ideals â€“ and that all SKAR members are genuinely driven by Iron Klawâ€™s fascist philosophy and by his charisma. It seems like her interest in Iron Klaw is purely that of an acolyte, but perhaps there is even some romantic attraction there. Also, we know she didnâ€™t already have an eye-patch when she joined SKAR, so there is a story somewhere of how she lost her eye. One that, sadly, will never be told. 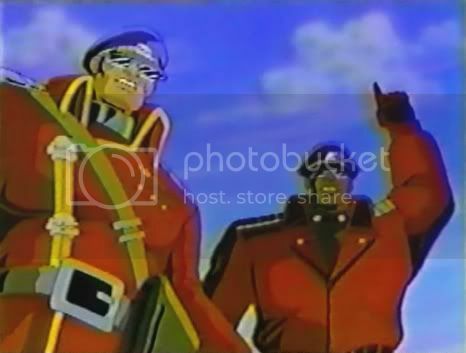 Oh, and the episode establishes a rivalry between Mayday and Steel Raven â€“ both pilots. Again, this never came to a head, but many ideas were frontloaded here. And, lest I forget, we see that Steel Raven is not above torturing Clancy (with an ELCTRIC WHIP, no less!) for infoâ€¦ as a matter of fact, she relished it. Great character. We also get some development of the Rampage character, albeit in the form of a sort-of comic subplot. When the false information gets out that Iron Klaw is dead, Rampage decides he should take over SKAR. 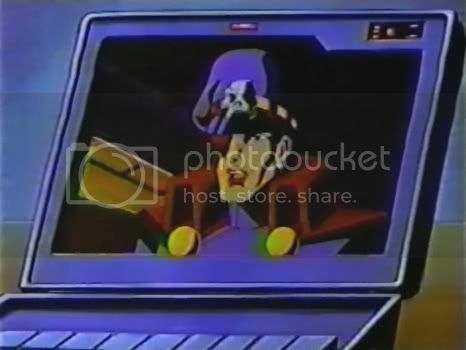 I donâ€™t know why a successful arms dealer would want to take over SKARâ€¦ it seems like an unnecessary hassle, (After all, Destro never tried to take over Cobra until he realized that it was the only way he could get Cobra Commander to stop bugging him.) but then, Rampage is not a normal successful arms dealerâ€¦ heâ€™s a nut. I would imagine that the experiments that lead to Rampage being a hot-head who turns into a green monster took place after he successfully built his company. (Unless he is just a Santino Corleone-type hot-headed heir to a pre-established empire.) The screaming, trigger happy Rampage we see here could have never built a business empire. What we learn is that, when Rampage grabs some SKAR troops (how, I donâ€™t know) and tries to rob Ft. Knox to bankroll his robotic operations and prove himself a worthy SKAR leader â€“ he mucks it up badly. As a matter of fact, heâ€™s got no plan and motivates his troops purely through threats (and by shooting at them over and over). He is quickly routed by the Joes and left as a hostage by Steel Raven. Iron Klaw/Clancy even puts him in the direct line of fire of a SKAR ambush. A longer EXTREME series might have given us a better idea of how such a temperamental moron 1. came to be, 2. came into possession of such an empire, and 3. conflicted with Iron Klaw down the line. By then end of this episode, while Lt. Stone is suspicious that SOMETHING is afoot, Iron Klaw is still comfortably operating out of the White House, Steel Raven has become de-facto leader of SKAR, and Clancy is getting electro-whipped by a chick in an eye patch. Iâ€™ll be doing writing reviews of each of the â€œIron Klaw as Clancyâ€ episodes, mostly with an eye towards what compelling ideas where introduced that made for good TV and would have played out in an interesting fashion over time. As usual, I find Extreme to be flawed, but far more interesting than it was given credit for. Much better than DIC Joe, and not entirely unlike C.O.P.S. Iron Klaw, still masquerading as Clancy, is beginning to raise Lt. Stoneâ€™s suspicion by being soft on possible Skar activity. Iron Klaw has ordered Skar to cease all activity for 30 days in an attempt to get G.I. Joe disbanded from lack of need. Metal Head goes undercover as a member of a rock band to attempt to find a bomber who is terrorizing New York. With time ticking on a Bomb threat the Joes scramble to find it before time runs out! All this and Metal Head finds a Skar recruitment flyer !! Does this mark the beginning of the fall of our favorite Hacker? 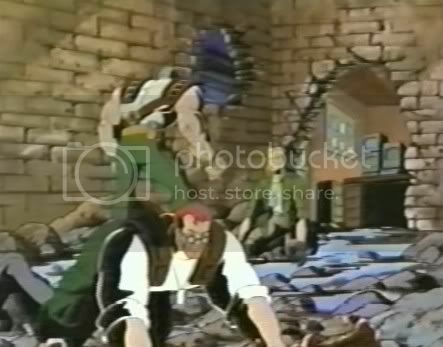 In the previous episode, "SKAR Under Siege", it was believed that Iron Klaw was killed when the Joes rescued Clancy from Baron Von Rani's castle in Kalistan. This resulted in low morale among the soldiers of S.K.A.R. 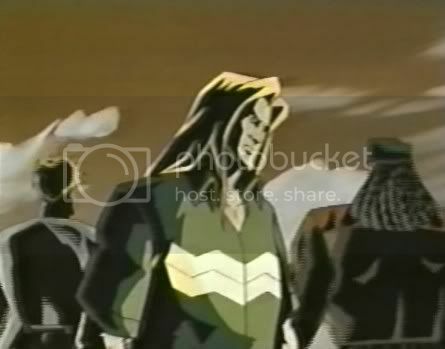 Lt. Stone suspected Iron Klaw may still be alive because he didn't see a body, but the only one who knows this charasmatic villain is alive is Steel Raven, but she must keep this secret because Klaw wants people to think he's dead so he can operate freely, especially masquerading as Joe leader Clancy. Operation: Underground opens with two explosions in Manhattan. One at a candy story, another in the sewer. Out of the smoke of one of these explosions walks a man who's shaped somewhat like a gorilla, gloating to himself. We then go to a S.K.A.R. 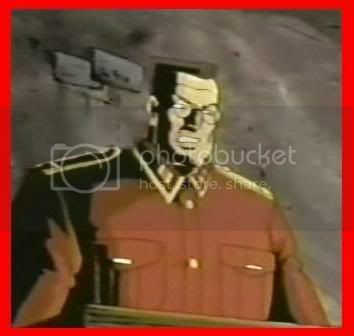 Recruiting Meeting where we see Colonel T. Devo a recruiter in an abandoned warehouse who utters "The World needs order. The World needs direction. The World needs us to save it." He asks what people have done that was worthy enough of the organization. The bomber comes forward to boast of his deeds but is chastised because his actions had no purpose and made no statement. S.K.A.R. is looking for disciplined recruits. The people turn against this guy calling him a monkey, both for his appearance and unsophisticated approach. He walks away saying he will make a statement. The next view is two helicopters landing outside a building in the desert identified as the G I Joe Weapons Factory. Clancy and the Joe team are greeted by Red McKnox, sort of like the Joe Team's version of Q. While giving a tour of the facility, Stone mentions that the Joe Team hasn't had a headquarters since Joe Island was destroyed in the battle of Washington DC. Red offers his base as a headquarters, and Clancy, captivated by some of the technology in development, quickly agrees. Red mentions some bombings in NYC. Stone suspects S.K.A.R. while Clancy says it is probably just a madman. A quick cut shows the bomber in a basement putting a bomb together and saying he will begin Operation: Underground. Back to Clancy's office and Iron Klaw is talking to others through a computer. These people are referred to as The Council and seem to be Iron Klaw's superiors!!!! One of the members of this Council says random terror is not S.K.A.R's way. Iron Klaw wants to cease operations for 30 days so that it will seem S.K.A.R. is gone, thereby removing the need for the G I Joe Team and resulting in its being disbanded. He wants to put a stop to the bombings, if only to prove that S.K.A.R. is not behind them. Lt. Stone and Metalhead then enter Clancy's office and IRON KLAW has reverted to his Clancy disguise. Clancy wants Metalhead to go to NY undercover as a muscian. Stone goes to the rec room where Black Dragon and Quickstryke are bored, and they wish they could have gone with Metalhead. Stone grants their wish. The three Joes talk to various people in the city trying to find leads. After a while Metalhead needs to leave for his gig. Shortly afterwards, there is an explosion. On a news ticker the message appears "Attention New York. In one hour I will destroy a famous landmark ...4 ...5 ...What comes after five?" Metalhead arrives at his audition. The rest of the members of the band Bird Call aren't happy that their manager is forcing them to add a new member, but Metalhead soon wins them over after he plays a few licks. Quickstryke and Black Dragon soon come by to discuss the clues with Metalhead. They leave and while walking down the street go by a subway entrance and conclude Number 6 refers to a train. As they enter a station they hear over the PA "Bang Bang Boom Boom, Are you ready to take me seriously? You've got 30 minutes, you want to make a monkey out of me? I wouldn't throw stones if I were you." They think the bomber is in a ticket booth but when they get there, they see the clerk unconcious and a tape player in front of the microphone. It's attached to a bomb which explodes shortly after they run away with the knocked out clerk. They then decide to split up, each taking a separate train. Quickstryke just misses his train so he runs back to the surface and uses his cable gun to hitch a ride on a helicopter and catch the train at the next station. Metalhead gets on his train wondering if he would know the bomber if he saw him, not realizing he is standing next to him. Once Black Dragon meets up with him on the train, he spots the bomber due to his simian appearance. As they get closer he pulls out a detonator. After disarming him, they ask him where the bomb is. He reveals he wouldn't ride on a train with a bomb, that's on the train in front of them. On that train, Quickstryke makes his way to the front of a train. A bomb explodes just as he enters the front pushing him back. He goes forward again and finds out the controls have been destroyed and he can't stop the train. Metalhead calls him over the radio telling him just that. He sees that the train's next stop is the Empire State Building, a famous landmark, and runs though the train telling the passengers to keep their heads down as he fears the coming explosion. When they go under the Empire State Building with no explosion, Metalhead notes there's minutes left on the timer. 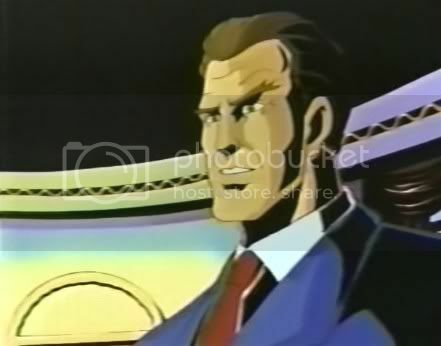 Quickstryke thinks of the bomber's clue of not throwing stones, which he surmises applies to glass houses, and the only building like that is the Inter Alliance Headquarters. 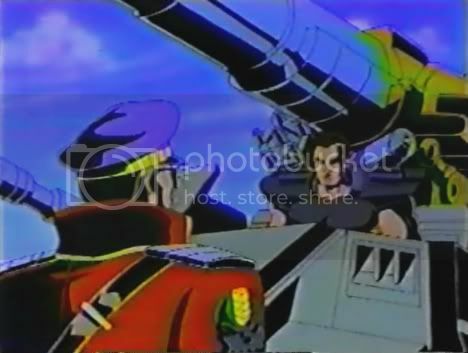 Metalhead says he can improvise a bomb sweeper from spare parts and Black Dragon says they can get to Quickstryke's train by catching up to him then using his cable gun to crossover. Quickstryke separates the passenger cars from their car and Metalhead finds the bomb with one minute left. He can't pull it out and doesn't have enough time to defuse it. Black Dragon sees a side track on a map on the wall and even though the controls in the train are destroyed, Quickstryke says they can take it the old fashioned way. He aims his cable gun at the switch and they change tracks. He fires again at an overhead beam and the three escape from the train just before it explodes. 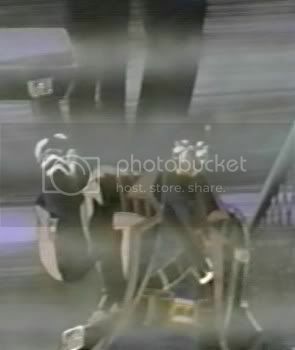 The episode ends with the bomber being taken into custody. Clancy is happy that the bomber is just crazy, but Stone still thinks S.K.A.R. is a threat. As they all walk away Metalhead finds a S.K.A.R. recruiting form and you hear the Inspiring speech that the S.K.A.R. RECRUITER was giving at the beginning of the episode. For a kid's show I thought this one was pretty good. I think all Joe cartoons do a pretty good job of developing their characters, and I like how Season 2 unfolded like one long story, much like my favorite shows, Lost and 24. I wasn't sure about the Joes' logic in solving the riddles of the bomber, but other than that I had no problems with it. There are some things that occurred that seemed trivial, like Metalhead joining a band, but were very important in setting up the events later on in the series ( see episodes 25-26) . I thought tracking a bomber was a pretty believable scenario, especially compared to many of the scenarios in the other GI Joe cartoons. 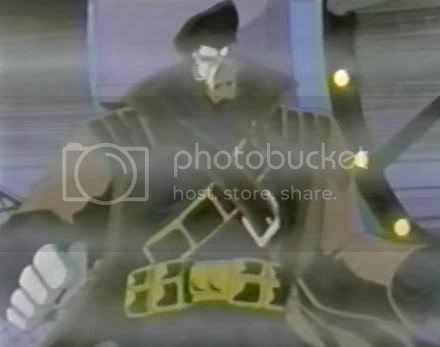 The first season gave a lot of coverage to Rampage and Inferno, and to a lesser extent, Wreckage, who along with Iron Klaw was my favorite villain. Season 2 begins with Steel Raven being the S.K.A.R. 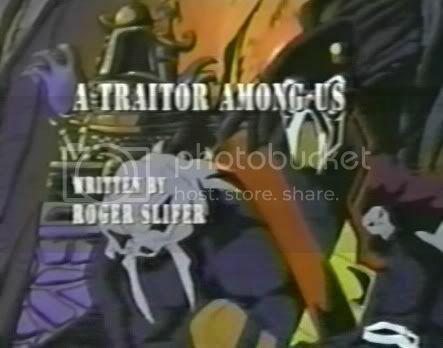 leader while KLAW is under cover as Clancy, so while the cartoon may be thought of as an advertisement for the toy, the enemy characters who get the most story time this season don't have figures. I wonder if there were plans to do them that got scrapped because the toy sold poorly or if the writers didn't want to be limited by the toys when telling their story. 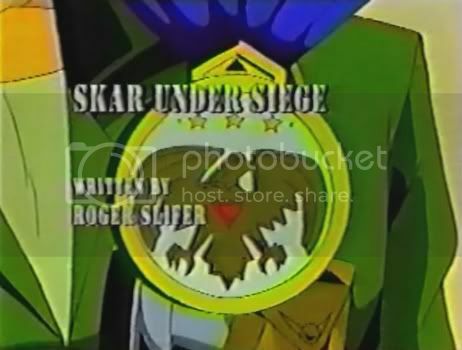 This is also the first episode where we get an idea that SKAR is part of a much larger organization and Iron Klaw is not the supreme ruler (a little bit like Cobra Commander's cameo in the Sgt Savage and His Screaming Eagles episode which tied him to General Blitz's IRON Army). I also thought it was interesting that the recruiter (a S.K.A.R. 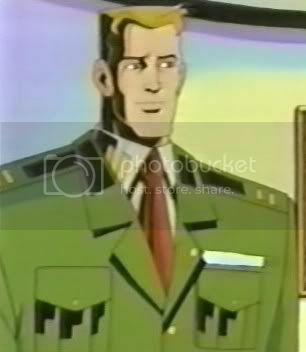 General) at the meeting at the beginning of the episode wore a uniform reminiscent of that of Jet Pack General Blitz from the Sgt. Savage line. Perhaps this would have been further developed had there been a third season. 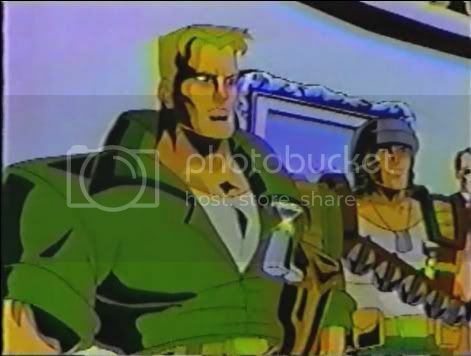 G I Joe Extreme may have been my favorite of the Joe cartoon series. I think it's mainly frowned on because the toys were done poorly, but for the most part, the storylines were far less outlandish that a lot of stuff from Sunbow, DIC, and Sigma Six. And I liked the way it was about a different generation of Joe, like Transformers: Beast Wars, Star Trek: The Next Generation, and the Star Wars prequels. I only wish this series made references to the past. Of course a 3rd season would have been cool too. 6. What is nice bit of continuity and cohesiveness, and interesting to note is that his Uniform resembles the other S.K.A.R. GENERALS from Episode 14. This makes it to be a nice and cohesive look that the upper command of S.K.A.R. has. Episode 16 begins with a flashback showing the defeat of Iron Klaw and the fact that he is now disguised as the Joe leader Clancy. Meanwhile in a secret S.K.A.R. base located in Hong Kong, Raven is torturing Clancy and submitting him to the brain drain machine, plucking all the top secret information from his brain. Sgt. 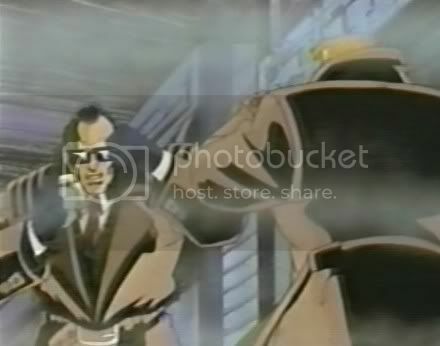 Savage suspects Metal Head of being a traitor when top secret plans he was working on go missing (Sgt Savage also starts to connect the dots, Thinking Metal Head is also the one who gave a away their location in "SKAR Under Siege"). In order to blow off some steam Sgt. Savage and Metal Head run the Joes obstacle training course. Before the obstacle course is finished the Joes come under attack by Skar jets equipped with the Joes top secret weapons homing system. Meanwhile Lt. Stone confronts Iron Klaw (Clancy) with his true identity. Lt. Stone informs Iron Klaw that he figured out the deception when he removed his sunglasses, since the real Clancy never removed his shades. (Interesting note: While gunning for Lt. Stone at the Coney Island amusement park Iron Klaw appears to be gunning down Hasbroâ€™s competition as he shoot a stuffed Power Rangers doll.) Lt. Stone and Iron Klaw end up dukeing it out and chasing each other all over the amusement park ending in Lt. Stone being thrown from a roller coaster. 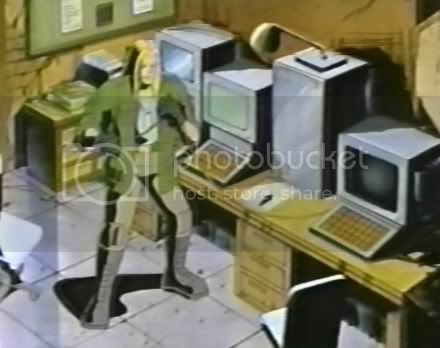 As the Joes base continues to get plummeted by Skar Sgt Savage reluctantly allows Metal Head to use his computer to try and counteract the Skar's missiles homing feature. As the battle is winding down Sgt Savage receives a call informing him that Lt. Stone is in the hospital. We are left hanging with Lt. Stone in a coma and Iron Klaw renewing his role as Clancy. Episode 17 should be really good as Iron Klaw will have to find some way of getting rid of Lt. Stone before he recovers enough to inform the other Joes that Iron Klaw is masquerading as Clancy. I was extremely excited about this episode as it gave a flashback to the death of Iron Klaw and the rescue of Clancy. The tension between Sgt. Savage and Metal Head is extremely well done for a thirty minute animation series, but could have been wrapped up better. I was disappointed in the "lets run the obstacle course instead of working on the problem". The whole obstacle course sequence just seems like a quick and easy way to get some punches in and eat up a few minutes of time that could have been better used in other ways. The ending with Iron Klaw besting Lt. Stone, capturing the S.K.A.R. traitor and continuing his impersonation of Clancy was an excellent and unsuspected twist! 1. This episode debuts Red Mcknox's second/ Alternate uniform, while I prefer his first one, this one is a nice one as well and perhaps a little better for the field I guess. 2. 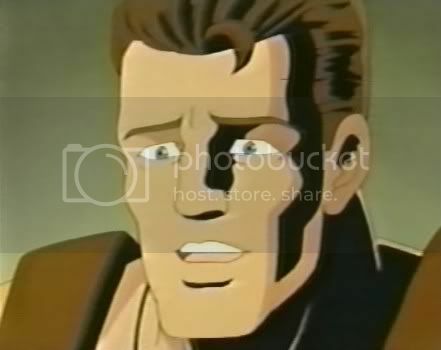 This episode we learn that in case of death or emergency Lt. Stones Next of Kin is Sgt Savage! 3.The reason the Sgt Savage and Metal Head situation isnt resolved is because for the rest of the season this will be a ongoing theme which will be resolved in the final two episodes. So horray for on-going plots! 6. We get to see Lt. Stone in two more Alternate outfits. One a traditional Military Dress that he wears when he goes to the white house. 9. Then later on Iron Klaw gets into his Traditional uniform in a trench coat as well! This is also one of the best fights in the whole series and Iron Klaw not only does a awesome job but he WINS!!! I think he looks bad to the bone with a Trench coat on! 10. 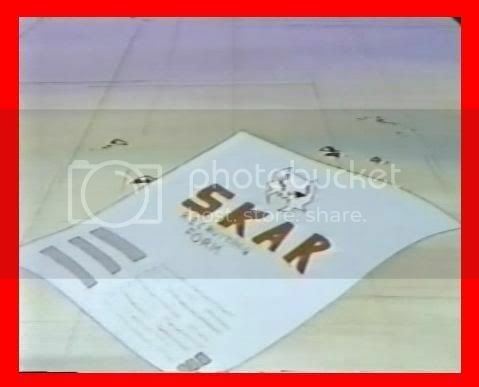 Finally in this episode we learn/ its unveiled that S.K.A.R. is bigger than IRON KLAW and that IRON KLAW is only the military leader of the organization ! 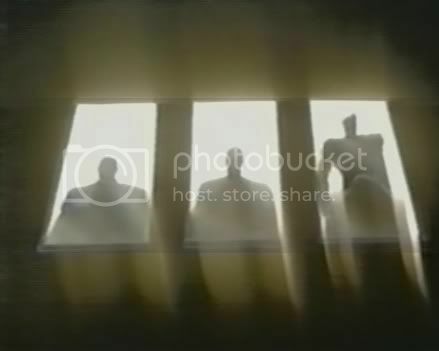 We see in the shadows its council of leaders who are in all levels of goverments and business all over the world!